A medium to large all wire cage with a removable tray (24" X 24" minimum floor space). Rabbits can get sore hocks(see my Health page for information on sore hocks) from constant contact with the wire. Therefore; a board should be put on the cage floor to give the rabbit's feet a rest from the wire. A box to hide in isn't a bad idea either. This provides a place to get away from the noise a commotion of your house. Toys are a good edition as well since bunnies can get bored without something to do during their long hours between play times. Please see my Cages, Supplies, and Services page to see the cages and supplies I sell and services I offer. 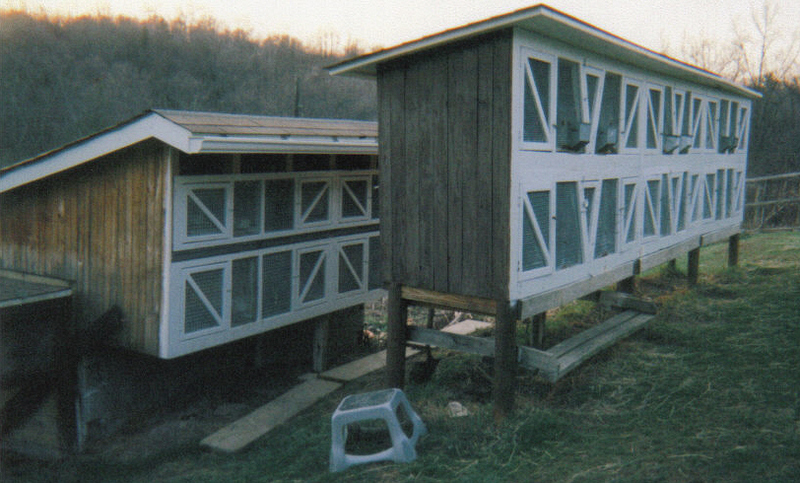 A wooden hutch (at least 3 feet off the ground) with a good roof, wire floor (16 or 18 gauge 1/2" X 1/2" or 1/2" X 1" wire with at least 1"extra" floor of 14 gauge 1" X 2" wire placed about 2 inches under the main floor---this prevents animals from biting at the rabbits feet) and front (16 or 18 gauge 1/2" X 1/2" or 16 gauge 1/2" X 1" wire). There should be no loose places in the wire for a wild animal to be able to rip holes in. A box is a good thing to have so the rabbit can have shelter from the wind and cold in the winter and heat in the summer (see my Health page for more information on cold and heat). This also gives them a place to hide if they become scared. A small board should also be put on the floor to provide the rabbit a place to rest its' paws. Male rabbits should be housed separately after about 5 months of age or they may fight and harm each other. They also have a tendency to spray urine to mark their territory if they are housed together. They can be neutered at 3-6 months of age to prevent this problem, however; and can live together very well if they are raised together or introduced slowly. Neutering prevents testicular cancer in males as well as territorial behavior such as urine marking.